DATE: Saturday, September 16 - October 28, Skip date October 21. 9 A.M. - 1 P.M. REGISTRATION: will be open August 15th at orangecoastcollege.augusoft.net (class will be under “Arts and Entertainment” and then “Visual Arts”), or call 714/432-5880, option 1. The skill of the blacksmith used to be a necessity for survival. Now however, it can become a necessity of a different kind. In this class students will learn to think with their hands and utilize their brains in a different way than is typical in modern society. This class will show how forging can become a necessity for the mind and body. 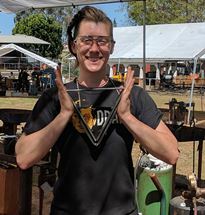 There are many different ways to work with metal, but blacksmithing is traditionally the one most concerned with solving odd problems, problems of form, function, and fabrication. Students will be given the opportunity to solve these problems though assigned projects, which can be altered to suit individual needs and creative styles. Learn the basics of forging or build on current skills. No previous experience is required, and all tools and materials will be supplied though it is recommended to bring your own as you advance.